Eggs: so tasty and such a great source of protein, and yet, so easy to treat them like nothing. Egg recipes are considered one’s entry to the magnificent world of cooking. You fry them, boil them, mix them with vegetables – or, best case scenario with potatoes and sausage – to make an omelette. I’ll give you my opinion in two words: SO BASIC. One of the reasons why I admire Greek cuisine is that, with zero technical skills, you can make the most boring food (yes, that would include eggs) look stunning. Fried eggs are considered pretty humble, but, for some of us they represent the absolute comfort food, when combined with the right ingredients. Also, they do need some extra care, as they are so easy to overcook. I acknowledge that the perfect eggs is as personal as political or religious views. As a matter of fact, there is no right or wrong way to cook them. Runny yolk, set opaque white vs crispy and browned white with firm yolk. When it comes to fried eggs, there are many ways to achieve perfection – however you translate that. 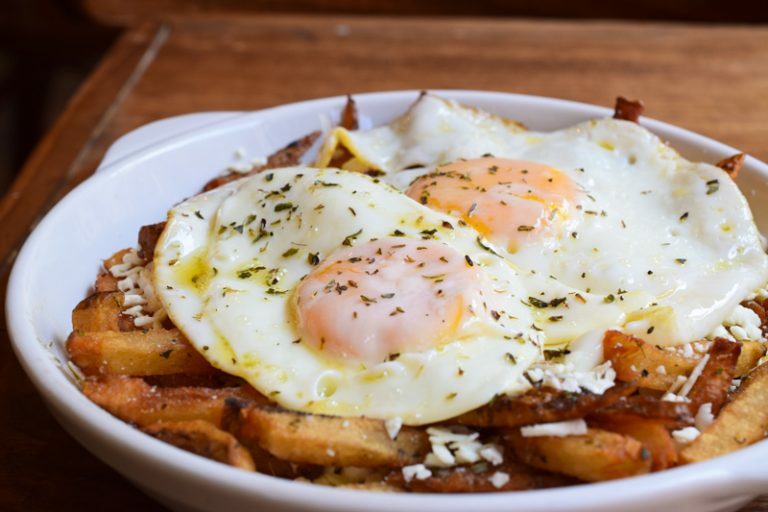 That’s what I had in mind when I first tried this egg-cellent, Greek inspired recipe: fried eggs with potatoes and feta. 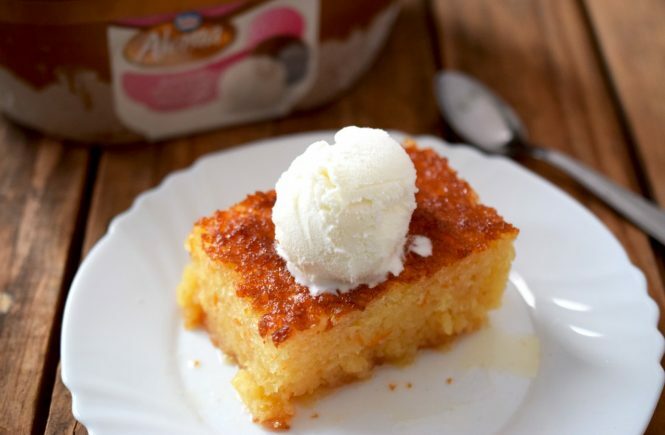 Such a versatile dish that you can upscale if you use fine Greek ingredients. Extra virgin olive oil, wild Greek oregano, potatoes from Naxos island and, of course, authentic Greek feta cheese. Complex-tasting, perfectly layered eggs, potatoes and feta – they stack up so well, you will be surprised why this is not served at all Greek restaurants as a basic (but in a good way!) Greek dish, just like moussaka and Greek salad. Special credits to my good friend Nick Spanos who is the master of creating crowd-pleasing comfort foods, absolutely worth- waiting long Saturday night queues. Thanks for treating me this awesome Greek dish in LES mate! P.S. May I suggest a game-changing tip? If you find yourself in Greece during the summer, you should definitely go to your local food market and get juicy tomatoes and firm, bright-green cucumbers to assemble a Greek salad as an entrée for your Greek eggs. 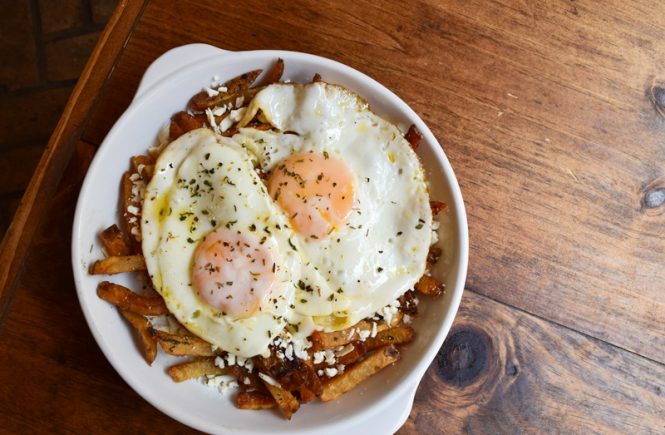 How scrumptious do these Greek fried eggs look? I couldn’t make up this stuff if I tried. You can thank me another time! 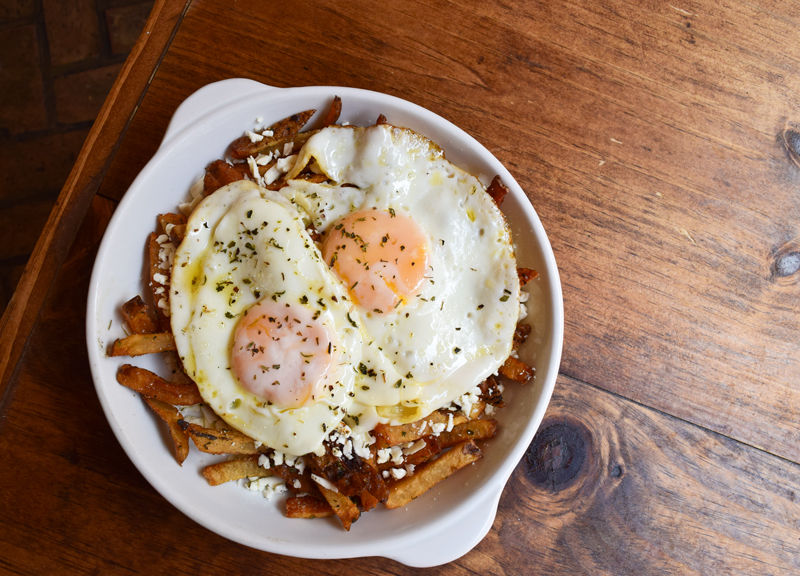 Fried eggs with potatoes and feta cheese are your go-to recipe when you are craving comfort food or an energy-packed breakfast! Prepare the potatoes: Peel the potatoes and then cut them in desired size. Bring a large pan of water to the boil, then cook the potatoes for 3 minutes. Drain, shake out onto a kitchen paper-lined tray and leave to cool. At this point you should be prepared to simultaneously cook eggs and potatoes. How to fry the potatoes: Heat the oil in a large non-stick frying pan until the olive oil begins to sizzle. If your pan isn’t large enough, fry the potatoes in batches rather than crowding them. Add the potatoes in a single layer. Be careful not too tightly pack them in the pan. Turn the heat to medium-high, so that the potatoes sizzle, but don’t stir until their bottom starts to brown. Turn them all 2 or 3 times until nicely browned all over for about 7 mins. Then lift them out and drain them on a plate coated with kitchen paper. How to fry your eggs: Place the pan over medium heat. Add the extra virgin olive oil. Swirl the pan to evenly coat the surface. The pan is ready when the oil starts to simmer and looks very loose. Crack the egg into a bowl (or directly over the pan, if you are more experienced) and tip it into the skillet. Let the egg cook for a few minutes without moving it. The whites will start to set after a few minutes. To be sure both whites and yolk are totally set, you can cover the pan partway through cooking. The steam from the egg and the olive oil will gently cook the top. The Greek way to cook the yolk is to swirl the pan, get a good spoonful of sizzling olive oil and pour it over the yolk, until you reach desired firmness. When the whites are set and the yolk is done to your liking, remove the pan from heat. Gently slide the spatula under the egg and transfer it to a plate. Eat immediately. Assemble the plate: Transfer fried potatoes in plates. Top with a fried egg, sprinkle with sea salt and Greek oregano. Serve immediately. Hi Tassos, I added smoked bacon to your recipe and it was a massive hit. I love how you give credit for this recipe to your friend. Kudos to both of you.